The pad editor allows to edit any rhythm in a visual way. Press Full Mode to show two additional tracks for toms or other instruments. The save button turns enabled when the current rhythms is not included in the library. Rename and Delete buttons are enabled when the current rhythms is an saved user rhythm. Tap the pads to add / edit / delete notes. Create a rhythm from scratch pressing "New Groove" button. Two popups will appear, asking for beats and subdivisions. Choose 4 beats and 4 subs for a typical 4/4 bar. For shuffle/swinging rhythms choose 4 beats, 3 subs. Rock Drum Machine allows to set different subdivisions for each beat in a groove. Long press in the beat until a red rectangle appears and drag the finger up ( substract notes ) or down (add notes). This way you can create advanced rhythms with different subdivisions and infinite possibilities. 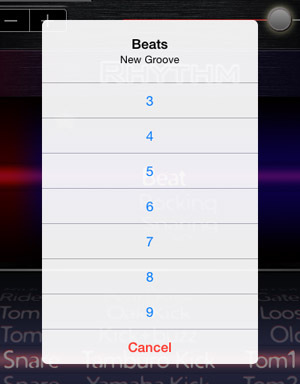 From the patterns sections you can edit rhythms by mixing patterns from other grooves. Random Patterns Tap the red dice to generate new rhythms from mixing patterns, a useful way to get new ideas.